I didn’t check a white thrift store t shirt carefully enough in the store. I brought it home and realized it has a stain I can’t remove. Bummer. 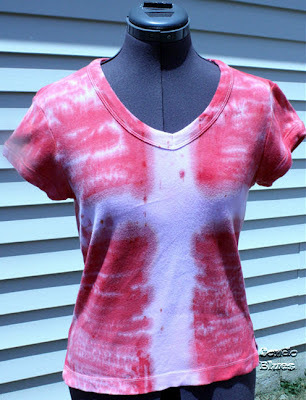 I tie dyed the t shirt and made it better than new! Once upon a time, a booth at the Viking Festival sold tie dyed Scandinavian flag t shirts. I wanted a Danish flag tie dye t shirt, but they were out of my size. They haven’t been back to the festival since. This idea inspired my t shirt design. I like to use a backpack when I am traveling because it doesn’t scream, I HAVE AN EXPENSIVE CAMERA IN HERE PLEASE STEAL IT like my fancy camera bag does. Unfortunately, once I switched to a heavier DSLR camera my current backpacks (I’ll get to that in a minute) didn’t work for me. The backpack straps sit on a knot I have in each shoulder. The extra weight of the camera plus whatever else I want to carry (water bottle, etc.) rides the knots like a cowboy on rodeo night. I get a migraine. Dealing with a migraine is not the way I want to spend my vacation, or for that matter, a blogging conference. 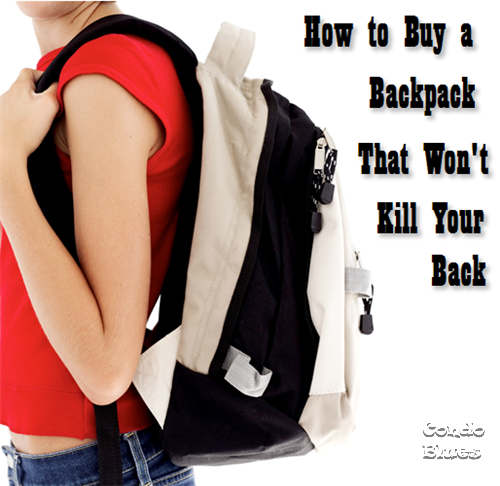 As a green blogger, I get information about backpacks made from eco friendly materials all the time. I appreciate that but an ill fitting backpack made from eco friendly materials is useless because I will spend more time and resources replacing it with more backpacks that may or may not hurt my back. If I have to go with a backpack made from not so eco friendly materials I’d rather it be made from material that takes a beating and lasts as long as my backpack from the 80’s that I still have and use. I am not a fan of brass knobs and drawer pulls, especially the Chippendale style brass drawer pulls. Too much of an old lady with a house that smells like bad cheese and 80's brass everything combo sandwich for me. Do not confuse this with Chippendale Dancers. Those Chippendales I like. If I got a dresser full of Chippendale drawer pulls in desperate need of a makeover, I'd be out the door buying new pulls before the first coat of paint was dry. Diane from in my own style has a cheaper, greener, and cuter way to go. 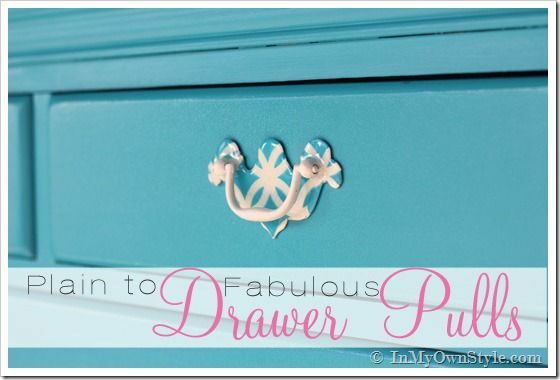 She remade the drawer pulls with paint and paper napkins. The colors she used are to die for too. My insomnia is visiting and won’t leave like an obnoxious relative (not that I have any experience with obnoxious relatives who won't leave my house. My relatives are lovely.) Putting my energy into a project helps me get through the days I miss Blitzkrieg so much that I want to jump out of my skin because I haven't slept in days. So instead of packing before I left for BlogHer, I grabbed the low VOC paint I had left over from painting the kitchen and used it to paint an accent wall in the living room as a no cost project. I have several half rolls of painter's tape in my tool stash (this will teach me to keep the garage more organized.) I also had a roll of masking tape I don't remember buying. 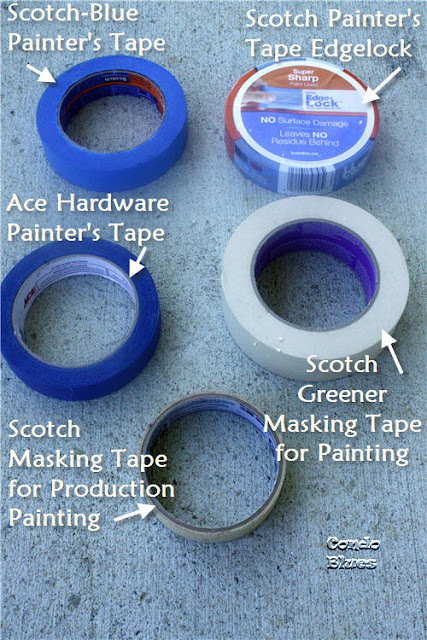 I remember my parents using masking tape to tape off windows and molding when they painted my childhood fixer upper but I’ve always used blue painter’s tape for painting projects. I’m not sure why. Ohio State Veterinary Hospital holds a Pet Remembrance Ceremony every year. Husband and I went and were immediately greeted by Blitzkrieg’s oncologist Dr. B. She hugged us and asked how we are doing before the ceremony. She is such a good person and a caring doctor. I can’t express how lucky you and your pet will be if she is your veterinarian. We heard words of comfort. We went to a small corner near the hospital I passed a dozen times before but didn’t know until now it is the Remembrance Garden. 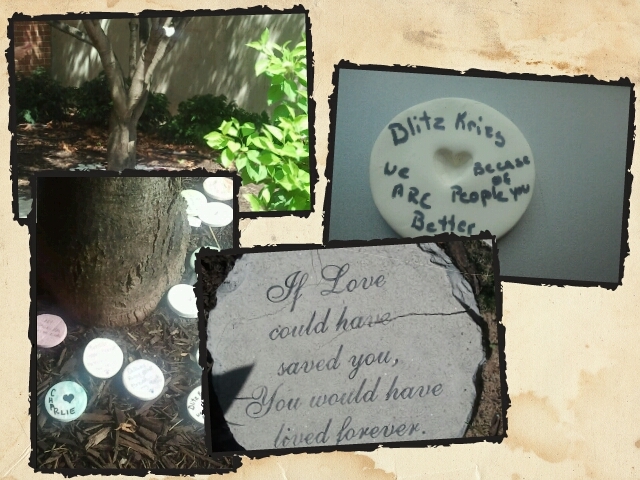 We placed stones with loving messages under the tree. Husband and I want to grow bitter melon this year. Unfortunately, bitter melon will not grow next to any of the other plants in our garden. Fortunately, our south facing patio is the perfect place to grow bitter melon. Unfortunately, we are better at watering the plants in the front of the house than the plants on the back patio. A self watering planter would solve this problem nicely. Then I priced self watering planters. Great googly moogly! The price is not so nice. Pin this easy gardening tutorial for later and to share with your friends! 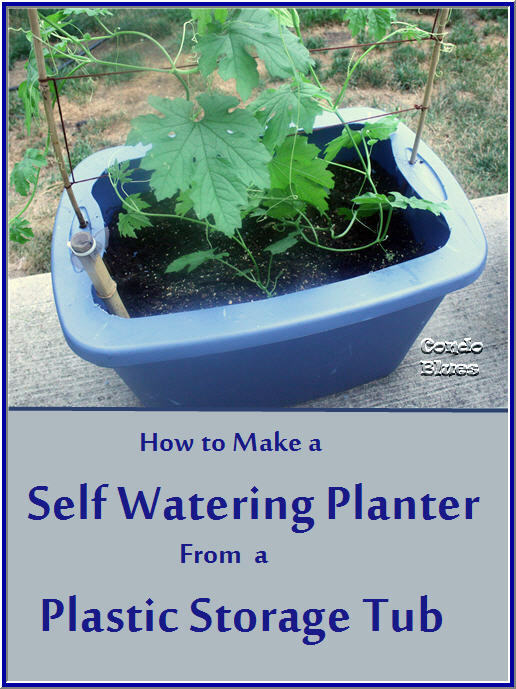 I did some research and saw a bunch of different designs and directions for self watering planters. There were a lot of you musts and you shoulds that contradicted other people's you musts and you shoulds. I turned to Rob of Rob’s World AKA the King of Building Self Watering Planters and peppered him with a bunch of questions. Who basically said either way is fine on any of number of things I questioned him about. I went with using a tub from BPA free #5 plastic (polypropylene) I had on hand to keep the cost down. I'd like something that looks a little nicer and won't potentionally tick off the Bitter Betty neighbor to report me to the Home Owner's Association. I’m considering building a wood surround to make it look a nicer. Eventually. It's on my massive DIY List. My personal and unintentional theme for this year’s BlogHer conference was Take a Risk. I am grieving my dear Blitzkrieg and worried about leaving Husband alone. It took everything I had pry myself from the house, put on semi happy face, and join 5,000 people in New York for the conference. Husband lined up time out with friends so I wouldn’t worry. He reminded me how important it is to thank as many of you in person as I can for your love and support during our cancer journey. He reminded me I paid for my BlogHer conference expenses months before Blitzkrieg got sick and made the investment in myself long ago. I spent the moola. I had to go. I brought a little security blanket with me. 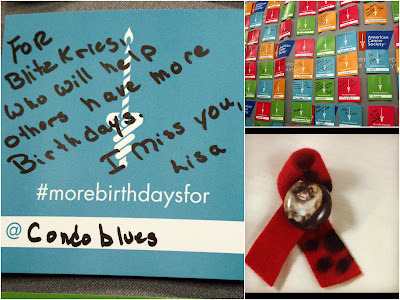 I made and wore a pin with Blitzkrieg on it backed by the canine lymphoma ribbon (red ribbon with paw prints) on my conference lanyard. The American Cancer Society saw it and asked me to add a pledge to their More Birthdays wall. Blitzkrieg donated tissue to the vet hospital’s research tissue bank where any researcher in the US can use it. Husband and I feel it is particularly important to donate because Blitzkrieg’s lymphoma did not play by any of the cancer rules. We hope our donation will keep another family from reliving our cancer story. 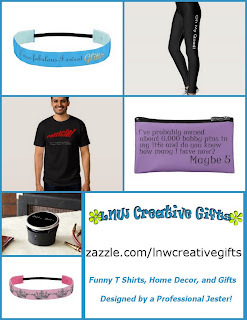 Friends, I have a massive treat for you today! Carmen De La Paz host of HGTV’s Hammer Heads and one of my favorite DIY gals, is guest posting today on Condo Blues! Easily transform an old school desk with vibrant colors using a color blocking technique to create a classic diamond pattern with two tones of color. This back-to-school desk refresh could even be a fun project for parents and kids to work on together! For high traffic furniture I always recommend a fresh coat of Satin Enamel paint – It has high durability, will accept the next layer of paint well and is easily cleaned with a damp cloth. When I go to a blog conference or am lucky enough to be invited to a blogger event, I notice several women wearing Twitter handle necklaces. This is a great way to let people you just met to know your Twitter handle so they can follow you after the conference or event. 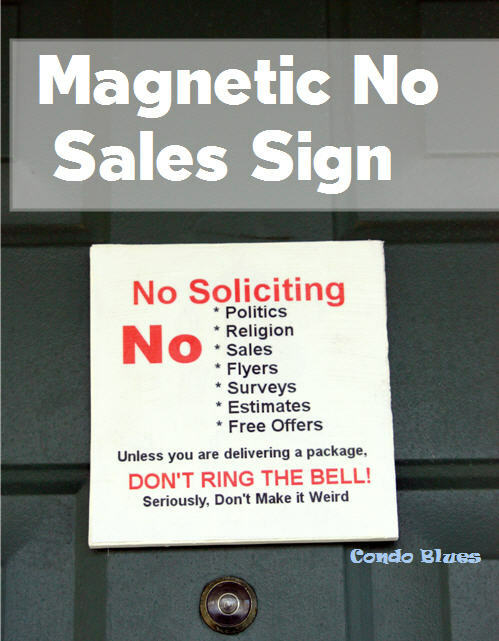 Between going to Blissdom and prepping for BlogHer, my world turned upside down. 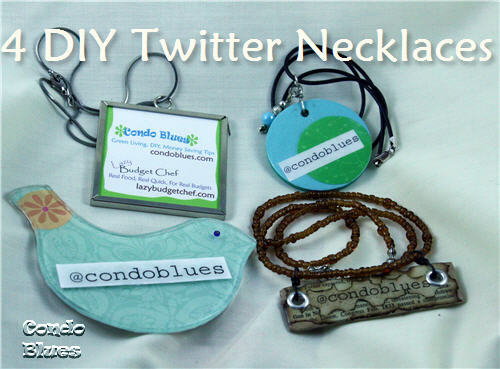 I did not have the time or energy to have a Twitter necklace made even though I had paid for all of my BlogHer expenses pre-canine cancer and everyone insists I still go to BlogHer. A free-to-every-customer-who-walks-through-the-door Mod Podge make and take event at Michael's (AKA not a blogger thing) gave me the idea to try to make a Twitter necklace. Two of them use reclaimed materials because I gotta be me.